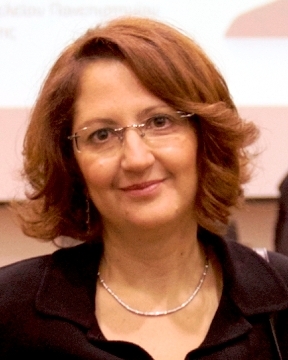 Lina (Triantafyllia) Papadopoulou is an associate professor of constitutional law and holder of a Jean Monnet Chair for European Constitutional Law and Culture, at the Aristotle University of Thessaloniki (AUTh), Greece. She studied Law at AUTh (Bachelor 1993), Trier (LLM 1994) and Hannover (PhD 1998) and Political Theory at the London School of Economics (LSE, MSc 1999). She was a Post-doc ‘Marie Curie’ Fellow at the LSE (2000-2001) and A.U.Th. (2001/02). Her primary areas of expertise include national, comparative and European constitutional issues and human rights, focusing on democracy and political parties, equality and non-discrimination, religion and the state, and bioethical issues (MAR, euthanasia etc). Her publications include monographs [‘European Political Parties’ (1999, in German), “National Constitution and Community Law: the ‘supremacy’ issue” (2009, in Greek), “Institutions of ‘direct democracy’ in the Constitution (2014, in Greek)] as well as more than 50 articles in Greek, English and German. Lina is member of the “European Constitutional Law Network” (ECLN), the “European Consortium for Church and State Research”, the “European Commission on Sexual Orientation Law” and the “International Association of Family Law”.